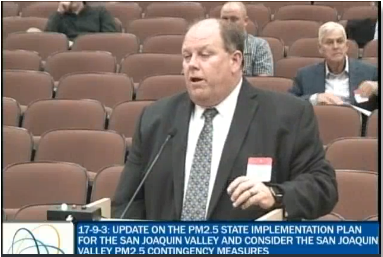 This past week, CCGGA President/CEO Roger Isom testified before the California Air Resources Board touting the success of the incentives approach to replacing tractors and harvesters in an effort to stave off a mandatory replacement regulation for tractors and harvesters. It was yet another hearing/meeting in a two-year process for CARB and the San Joaquin Valley Air Pollution Control District. CARB announced they are now looking at putting a firm date in place by which all Tier 0 and Tier 1 engine equipped tractors and harvesters would have to be replaced. Those dates were not announced and Isom encouraged the board to allow the incentives to work. Isom also briefed the board on the huge influx of money coming from the recent Greenhouse Gas Reduction Fund (GGRF) budget bill that was passed that will being $135 million in incentive funding for agricultural equipment. This is very significant and should be allowed to be utilized first, Isom stated. The latest timeline has the Air District adopting the State Implementation Plan (SIP) in December and CARB will consider the plan in March. This entry was posted in NEWS & ISSUES on October 2, 2017 by ccgga.